The COMBIFLEX is a fully flexible 6-layer aluminium / polyester laminate duct. The outside is a co-polymer, antistatic layer. The aluminium and polyester layers overlap each other entirely. This “sandwich” construction of the layers results in a higher external resistance against sparks. 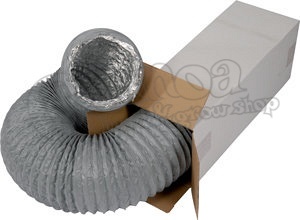 The COMBIFLEX flexible ducts are used in ventilation, air conditioning, and air handling systems with low and moderate air pressure where a high mechanical strength, and temperature resistance is required.